The fisheye lens produces some extremely unusual photographs. Deriving its name from an angle of view closely associated with that of a fish's eye, this type of lens was originally manufactured because its 180° angle could record celestial observations of an entire hemisphere. The exaggerated fisheye world can be seen in the finder of the SLR camera and this lens is now commonly used for creative photography. 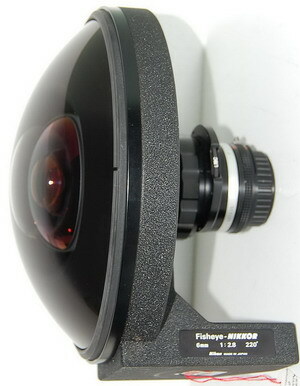 The construction of the fisheye is similar to the retrofocus type lens in which rays of light from a full 180° angle are first refracted into a cone by the concave front element and next formed into a circular image by the convex rear element. Because of the —100% distortion, the lens is not affected by the cosine fourth law and uniform edge-to-edge light distribution can be obtained. There are different types of fisheye's distortion. The advantage of this type is that the cubical angle of the image is easily calculated based on image size making it an excellent choice for scientific and technical applications. Because of the distortion, a circular picture is formed and the film format is not fully utilized. Another fisheye is designed to crop a rectangle out of the circular image. Because of the extraordinary angle of view, the photographer has to take certain precautions when using a fisheye lens. Naturally, the protruding front surface must be protected with a cap when changing lenses and film. But more important, before taking the picture he must check the viewfinder to make sure the legs of his tripod, his head and his feet do not appear.